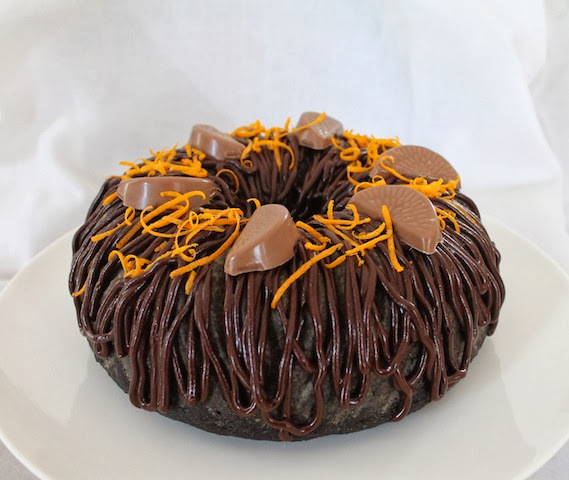 Orange and chocolate are a classic combination. 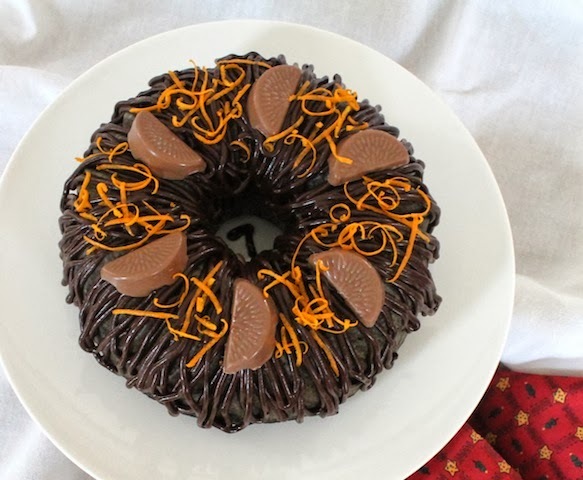 Using dark chocolate and whole Mandarin oranges pureed in the batter brings a sweet, yet bitter tartness to this tender crumbed cake Dark Chocolate Orange Bundt with Dark Chocolate Orange Glaze. For the British, especially, chocolate and orange are a treasured Christmas flavor combination and many would say that a Christmas stocking without a chocolate orange is half empty. Even if it’s full. But I must admit that it is not something that I grew up with. Like all great relationships, it has taken a while to grow and mature. Rather like my love of marmalade. And Brussels sprouts, eggplant and cooked cabbage. And other grownup things. Such is the British influence here that the stores in Dubai are full of all kinds of candies in chocolate and orange so it was a natural choice for this month’s theme of Holiday December! Where do you fall on the continuum of Love it (10) and Hate it (0)? If you are somewhere in the lower half, perhaps this delicious cake will slide your opinion up the scale. Put the Mandarin oranges in a small pot and cover with water. Bring to a boil over a medium heat and then simmer for an hour. Keep checking to make sure the oranges are always covered, adding more water if necessary, and turning them over occasionally. Meanwhile, butter your Bundt pan and coat it well with flour. In a medium sized mixing bowl, combine your flour, cocoa, sugar, salt, baking powder and baking soda. Set aside. When the hour is up, remove the pot from the heat and leave the oranges in it until they are cool enough to handle. Puree both oranges, peel and all, with a hand blender, add in the milk and set aside. With electric beaters or in your stand mixer, cream the butter and sugar together until light and fluffy. Add in the eggs, one at a time, beating well in between. Mix in half of the flour/cocoa and beat until combined. Pour in half of the orange/milk and beat until combined. Look at the gorgeous color of that orange puree! Repeat with the rest of the flour/cocoa and then the orange/milk. Pour your batter into the prepared Bundt pan and bake for 50-60 minutes or until a toothpick inserted comes out clean. Let cool in the pan for about 10 minutes then turn out on a wire rack and allow to cool completely. Meanwhile, to make the glaze, melt the chocolate in a microwaveable bowl and add in the Grand Marnier and canola oil and stir well. The liqueur makes the chocolate thicken up and the oil helps it become pourable again. If you would prefer not to add alcohol to the chocolate, you can skip the oil as well and drizzle on straight melted chocolate. Once the cake is completely cool, use a piping bag to drizzle the glaze all over the cake. Or put it in a plastic baggie and cut a small corner off to do the same. Add the chocolate orange slices and orange zest, if desired. I hope you have all enjoyed the past year of Bundts from our BundtaMonth group. Our fearless leaders, Anuradha from Baker Street and Lora from Cake Duchess have decided to disband. I’d like to thank them for their support and hard work. Meanwhile, I’ve got one last BundtaMonth list of cakes to share! 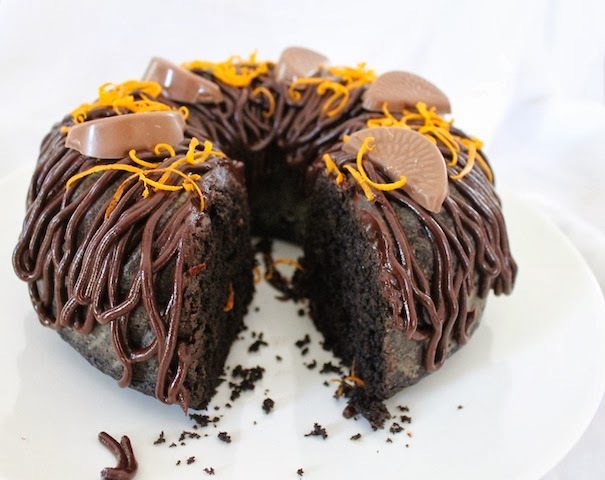 That's a lovely choco cake and chocolate and orange do complement each other. Like how you decorated it. Enjoy your weekend. That bundt shape is stunning and I am having extreme bundt pan envy ;). Chocolate oranges were popular for me growing up, but I think that a candy called Jaffa's spoiled it for me and I wasn't a fan. However after seeing your cake I think I may be ready to take another taste of this flavor combination. Growing up I was close to a 1. Now, I am closer to an 8 although I can be convinced to go to 10 at times! I love the bundt pan. It is gorgeous. That cake looks so lovely, I will be baking it soon as part of the holiday baking. Love the classic combination of chocolate and oranges, I have used these flavours while making cupcakes but used only orange juice. This technique of using pureed oranges is new to me, will like to try it. Anything that's got dark chocolate in it is bound to taste good and your cake even without the glaze looks beautiful. Chere Stacy, can you please tell me what it is, a Bundt? Is it a part of your sailing boat? I am IN LOVE with your cake!! I love chocolate and orange together. This is so intriguing with the pureed oranges in the cake and it looks so rich and chocolatey. I definitely want to make this! Absolument! They are often used as decoration for regattas. Bundting. As seen in the photo here. Absolument! They are often used as decoration for regattas. Bundting. As see in the photo here. Thanks, Kate! It is indeed very rich but the orange helps cut through that. Thank you, Deepti! The pan is a new addition to my collection. My sister just gave it to me as a gift. I have a favorite recipe from Nigella Lawson that uses the whole oranges so I got the idea from her. It really comes out nice, with lots of great orange flavor that goes wonderfully with the dark chocolate. I hope you like it too! I knew I must be a long lost member of the Beaucoup family! This just confirms it for me. Your gingerbread awesomeness is truly, truly the awesomest. Tell Mum I'm coming for Christmas after all. Thanks, Betsy! I am not sure I would have even registered a 1 as a child. I love my Bundt pan too! It was a gift from my sister. There you go! The English are the evangelists of chocolate oranges. Spreading the good news! Thanks for pinning! Thank you, Cheah! I hope you had a great weekend as well! Do give it another try, Felice. It's deeply, richly chocolate but the orange just cuts through that and shines. That's amazing, looks great, hubby always gets me one of the chocolate oranges for Christmas. It will be different this year as we will be away!! Wow-- yes those flavors are very English. My British husband will thank you for this recipe! Gorgeous! Aha. My rosbif friends tell me a bunt is a part of a sail. But perhaps they are confusing their bunt with your bundt. Your cake is very beautiful. Perhaps he'll think to tuck one in the suitcase, Tara. I hope he likes it as much as we did, Holly!